Galway and Mayo have played out some heated encounters recently. JANUARY SAW GALWAY finish with 12 men after a Friday night battle in Castlebar. 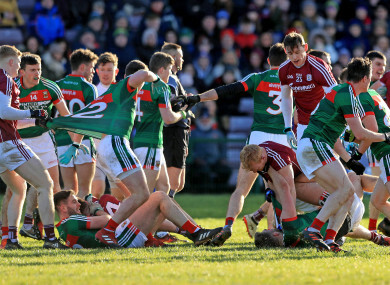 February saw Mayo end up with 13 men and Galway’s Paul Conroy was also dismissed in a heated league encounter in Salthill. And last June’s championship meeting saw Mayo’s celebrated defender Keith Higgins sent-off. The frequent brandishing of cards in recent meetings has contributed to the rising anticipation ahead of Galway and Mayo’s championship meeting on 13 May. After Mayo ruled supreme in the province between 2011 and 2015, they’ve been knocked out at the semi-final stage by Galway for the past two summers. It may be early in the season but the magnitude of the match is not lost on defender Chris Barrett. Is it the biggest Connacht championship game that he has prepared for? “I think it is yeah, definitely,” said the Belmullet man. “Like with Galway doing as well as they are (and) I suppose us getting to the All-Ireland final last year as well, it’s really building up into a huge game. I imagine it’ll be close to a sell out. Galway have improved rapidly in recent campaigns. “They’re strong, they’re fit, they’ve a good way of playing. They’re a Tier 1 team at this stage. Galway are physically strong and they want to impose and dominate. Barrett has not lined out for Mayo since last September’s All-Ireland final. He damaged cartilage in his knee while in action for Ireland in the second International Rules test and after returning to training in early March, an appearance in the league did not materialise. “2017 was probably the best year in a long time I’ve had with injuries. I got back on the pitch around I think it was March and pretty much trained right through which was the first in a long time that I got a good block of training. Then I hurt my knee on the Aussie Rules trip. “I didn’t get back training probably until the beginning of March so didn’t quite make the end of the league. I was hoping to get two or three matches at the end of the league, that was the plan but it didn’t really transpire that way. Email “'Definitely in the last couple of years there is a bit of an edge and a bit of a bite' - the Galway Mayo rivalry”. Feedback on “'Definitely in the last couple of years there is a bit of an edge and a bit of a bite' - the Galway Mayo rivalry”.